Gautam Gambhir will lead a depleted Indian side to the limited-overs leg of the West Indies tour, with five first-choice players including Sachin Tendulkar and MS Dhoni either rested or injured. As expected, the national selectors haven't given much weightage to performances in the IPL, instead rewarding results in the more traditional domestic competitions. S Badrinath, Rohit Sharma and Parthiv Patel muscled their way in helped by the weight of runs in both formats of the Ranji Trophy. R Vinay Kumar, Ishant Sharma and Amit Mishra made their way back, replacing Ashish Nehra (injured), Sreesanth and Piyush Chawla (both dropped). Praveen Kumar duly took his place back, having recovered from the elbow injury that had kept him out of the World Cup. He replaces Zaheer Khan, who has been rested. With five vacancies created - Virender Sehwag being the other - there had been some hype created around the IPL performers in the week leading to the selection meeting. The selectors seem to have learned from the debuts handed to Manpreet Gony and Ashok Dinda based on the first IPL, and also from RP Singh's comeback based on the second IPL. As it turned out, the likes of Ambati Rayudu and Rahul Sharma missed out this time. Badrinath and Rohit were the two top run-getters in the Ranji Trophy first-class competition while Parthiv was the second-highest in the Ranji one-dayers. The exclusion of M Vijay - who has a highest of 33 in 11 ODI innings - makes Parthiv the likeliest candidate to open the innings with the captain, Gambhir. "I am confident that we will do well and win the series in the West Indies. The team is well balanced," said Kris Srikkanth, India's chairman of selectors. "Everything is on merit. It's a great opportunity for a lot of players. "On tours, we always take two wicketkeepers. It's a 16-member team and in case of a wicketkeeper getting injured, you have to understand the logistics [of getting a replacement to] in the West Indies [are complicated]." This is not Gambhir's first shot at leading India - he was the captain when India beat New Zealand 5-0 in ODIs last year. The selectors are believed to be impressed with his leadership skills, and are likely to make him full-time vice-captain ahead of the slightly reluctant Sehwag, although they haven't yet made any formal announcement to that effect. There was a minor surprise thrown up in the bowling department with Mishra getting in ahead of Pragyan Ojha as the third spinner. In his 16 ODIs - all but three of them against Sri Lanka, who are good players of spin - Ojha has given away runs at only 4.31 an over. However, he was injured before the World Cup and missed the first-class season as well. In the domestic one-dayers, Mishra, with 18 wickets from six games, outperformed Ojha, who managed five in five. Vinay and Ishant, who have been there or thereabouts, are the only ones to have benefited from good showings in the IPL. It can be argued, though, that they are not unknown commodities and their performances in the IPL have been more of reassurance than first notice. 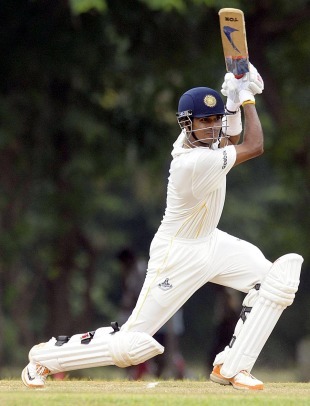 India also picked wicketkeeping cover for Parthiv, making Wriddhiman Saha the 16th member of the squad. India play one Twenty20 and five ODIs against the hosts beginning with the Twenty20 game on June 4. Squad: Gautam Gambhir (captain), Suresh Raina, Parthiv Patel (wk), Virat Kohli, Yuvraj Singh, S Badrinath, Rohit Sharma, Harbhajan Singh, R Ashwin, Praveen Kumar, Ishant Sharma, Munaf Patel, Vinay Kumar, Yusuf Pathan, Amit Mishra, Wriddhiman Saha (wk).